One of our institute instructors, Russ Pulliam, has homeschooled his children with his wife and he himself is associate editor/columnist for the Indianapolis Star. He is also a board member and occasional writer for World magazine (www.worldmag.com) He has been coming up to Grand Rapids, Mich., for several years now to provide basic writing and reporting instruction. 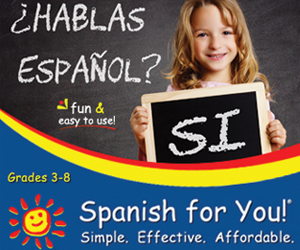 He is a very effective instructor who engages the students in hands-on writing activities. In the past, some families have driven their child to our institute, got them settled and unpacked and then went camping themselves while their child enjoyed CJI. Just an idea. Others have had their students fly into Grand Rapids, Mich, airport, where one of my staff could pick them up and return them to the airport at the end of the week. If you are in or around Evanston and looking for some help or inspiration in the writing department . . .
Susan Dickman is an experienced English teacher as well as a writer. She offers individual writing support and classes for students, as well as workshops for parents seeking to support their children’s written expression. Whether it is writing poetry, fiction, personal or nonfiction essays, research arguments, opinion pieces, or analytical analyses, she believes anyone can learn to brainstorm, draft, and revise, developing voice and giving structure to his or her ideas. Highly experienced and knowledgable about Gifted, Twice-Exceptional, LD/ED, and a former homeschooling parent. Just a quick post to say how much I love IEW (Institute for Excellence in Writing)! Jericho was the first city that the Israelites needed to conquer. Israelite spies got sent to scope out the land. The Israelites’ reputation made the people in Jericho scared. Rahab had believed in the Israelites. Rahab heard the Israelites crossed the Red Sea. Rahab hid the Israelite spies in her house. They told her to put a red rope out her window. The Israelites promised her protection when they were attacking Jericho. Do you have an inner novelist just bursting to get out? Or do you live with a hidden novelist? November has become the National Novel Writing Month, and now is the time to let that little novelist out of hiding. And, they have the event targeted toward kids in elementary school to high school as well. This would fit in well with your homeschool curriculum and is perfect for this time of year before life gets nuts with the holidays, but fall sports have wrapped up and you need something to look forward to working on indoors with a hot cup of tea and fuzzy slippers. The kids’ site has tons of resources and downloadable ebooks that will walk your kids through the process of writing their own novel in 30 days. There’s information for educators, lesson plans, badges, forums, and tons of other cool stuff to get you motivated and help writers not throw in the towel half way through. I have heard from many that gave it a try and couldn’t believe how many thousands of words their kids could write in a month when they just let the words fly and didn’t worry about anything but getting the story out. This year, we are going to give it a shot, at least some of us. Maybe even me. We’ll see. Any Na No Wri Mo veterans out there? Anyone with a novel burning to get out? Less than a week until the event begins, so now is the time to start thinking about where you are headed, dreaming up characters, and sketching some possible plots. Or, just wait until November 1 and just open your computer and see where your fingers lead you. Either way sign up so you can tally your wordcount and even if you don’t write a great novel, you can finish and say you did it. Check out all their details and get ready to write. I am in charge of the journalism program at a Christian university in Michigan. I was wondering if you might be able to help me communicate an opportunity regarding a residential summer high schoolers’ journalism/writing camp at Cornerstone University in Grand Rapids, Mich., with Illinois Christian home schooling parents with whom you might be acquainted in your group? 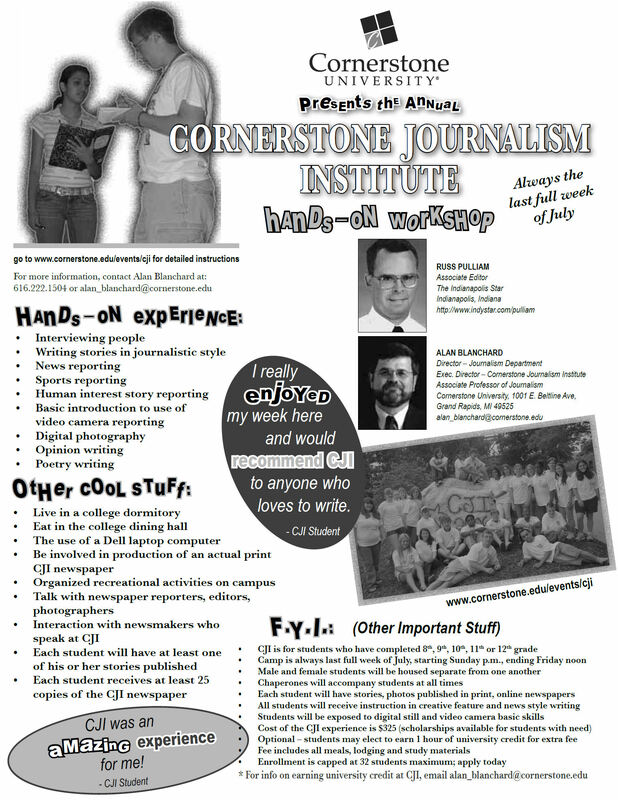 Students who were 8th-, 9th-, 10th- 11th- or 12th-graders this past school year are eligible to apply to attend the 10th annual Cornerstone Journalism Institute. At the end of the week, students’ articles and photographs are compiled into an actual newspaper that rolls off of a printing press; and students bring a bundle of newspapers home to show proof of their work to family, friends and schoolmates back home. One of our institute’s instructors, a dedicated Christian, Russ Pulliam, has home-schooled his children with his wife, and he himself is associate editor/columnist for the Indianapolis Star. He has been coming up to Grand Rapids, Mich., for several years now to lead a couple of the writing sessions and is very good at it. If you provide me with your email address, I can email you more information about the camp. We typically have a number of home school students attend our institute and many years we have had students from Illinois, Ohio, Indiana, Maryland, Virginia, California and Michigan. I would love to have a good contingent of home schoolers attend from Illinois this summer. While the regular camp cost is $325, I am offering a special discounted rate of $275 to any Illinois home school student who registers and pays in full by/before July 6, 2012. In the past, some families have driven their child to our institute, got them settled and unpacked in the dormitory and then went camping themselves while their child enjoyed CJI. Just an idea. We provide 24-7 adult oversight of the students in our charge during the week of camp. I would be happy to answer any questions you might have … I’m most easily reached by email or by cell at: 616.835.5574, as I’m not in my university office very much during the summer. Can you help spread word of this camp with your fellow home school families in your region? Executive Director CJI |Assoc. Professor/Director Journalism Dept. An organization known as Creative Communication offers contests in the area of art and writing to students of various ages. There is no fee to enter and they publish a book (which they then sell) of winning entries. This can be a fun motivator if just working toward a grade or even just to get an assignment finished is getting a little old.